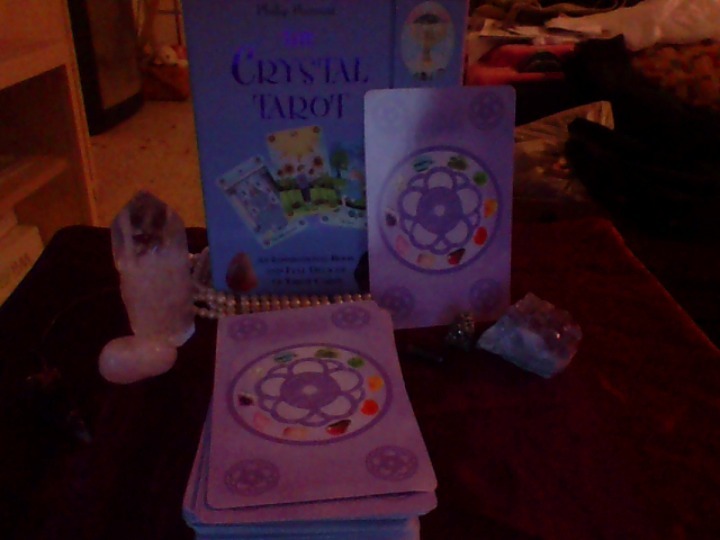 So far things are going great with this oracle deck. 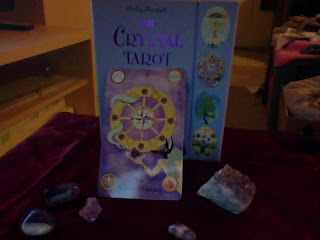 I used it for one 1-card self reading this morning and last night for a 1-card group reading. Both felt true and the message came through clear. 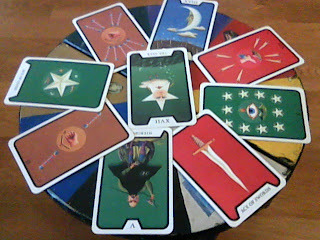 I look forward to working with this deck more and more. I LOVE the back of these cards. 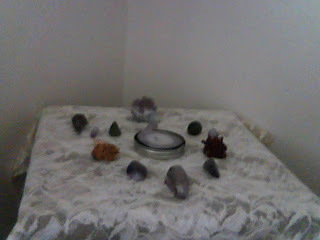 Such a pretty crystal grid. And of course, its purple, my favorite color. 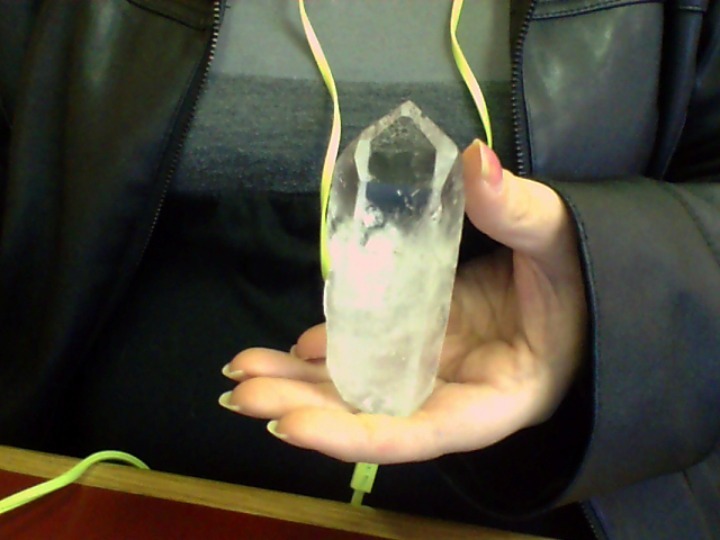 This is my new crystal companion, Araceli. The name means altar in the sky. When I was interested in the name of this friend I got a definite "air" feeling and that there was an "ah" sound to the name. Then meditated with is and had an image of sitting on the edge of a clif, wind blowing in my face, deep cavern below, and the sky all around me like I was floating in a sacred place in the sky. Araceli means "altar in the sky." I thought it was appropriate. 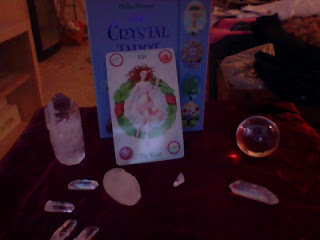 Another amazing thing about this crystal, which I didn't notice until after I bought it, was that there is a tiny angelic being image in it. I've been reading up on Crystals lately and I was wanting to go a bit more in-depth in my studies other than just simply this stone in this color has this meaning. 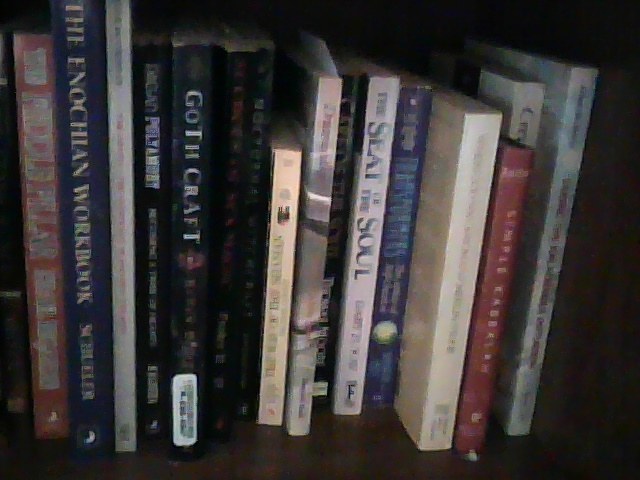 There are a ton of books out there about that, I recommend Judy Hall's books, she's awesome, but I needed to know more (there's the Raja yogi in me). So I've been watching Hibiscus Moon on Youtube, and if you don't know Hibiscus Moon and are into stones and crystals at all you should check out her site and her vids! She's amazing. 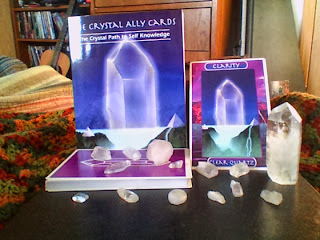 In crystal articles and some videos certain terms started popping up for me (probably because I'm finally ready to learn more and eager to listen) - terms like "key" and "Isis face" and "record keepers." I kept hearing them come up and finally decided to dig deeper into this crystal mine. And HERE is a video on how to Open and Close Records and how to use them from UnderWorldClassroom. So there's a few vids for you all to answer some questions I was asking and you might be too. Also, in my crystal research I took HM's recommendation and bought The Crystalline Transmission by Katrina Raphaell and the book is not for a light reader, I must say. This is a book that you might want to take in spurts or tuck up with some tea, a blanket and your favorite meditation quartz and read for a while when you won't be interrupted. There is A LOT of info in this book. I haven't finished it as I just bought it but I'll try and remember to post my reflections and what not later when I do finish. As some of you may remember, I did a series of blog posts a while back on 10 basic herbs that I was learning about in my lessons on Witch School, taught by my mentor Rev. Sherry Cooper. I am now taking her second herb class, Basic Herbs 102 and, like the last group of blog posts, I will be going over the 3 herbs I learn in each lesson and giving you spells and formulae that I learn outside of the course. I will not be giving course information as it is a free lesson and any of you can easily log into Witch School and sign up for the Basic Herbs 101 and 102 classes yourself and any info I put on here will simply be redundant. If you have not read my previous blog posts, please check out the lesson 10 post which has links to all of the previous ones. With that, let's begin! Medicinal Uses: Used as tinctures, extracts & capsules. Stimulates bile production and helps with digestive disorders. Dandelion reduces swelling and inflammation. It may help with gallstones. Women’s health has benefited from the use of dandelion for menstrual problems. 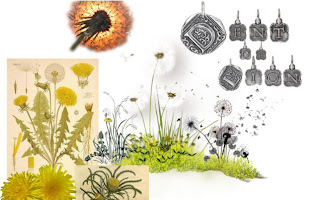 Dandelions are some of the simplest magical tools, and many of us have been using them as such since we were children and are a great way to teach other children the basics of spells. When the dandelion's go to seed, their heads become puff-balls of little parachuted seeds ready to take flight. Pick them, make a wish and blow and, much like birthday candles, if all of the seeds go in one puff of air, your wish will come true. Another way to work with this is, supposedly, if you blow on a puffed head, the number of seeds you have left is how many years you have left in life. To tell the time, blow on the dandelion head three times and the hour will be shown in the number of seeds left. 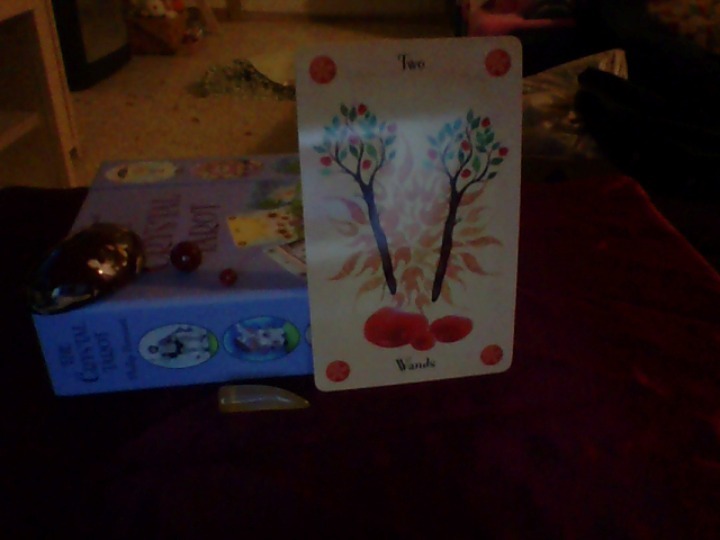 To send a message to a loved one, blow the seeds in his or her direction with the message in mind. Dandelion's are herbs of Jupiter, the Sun, and Leo as well as the element of air and the tarot card Strength. 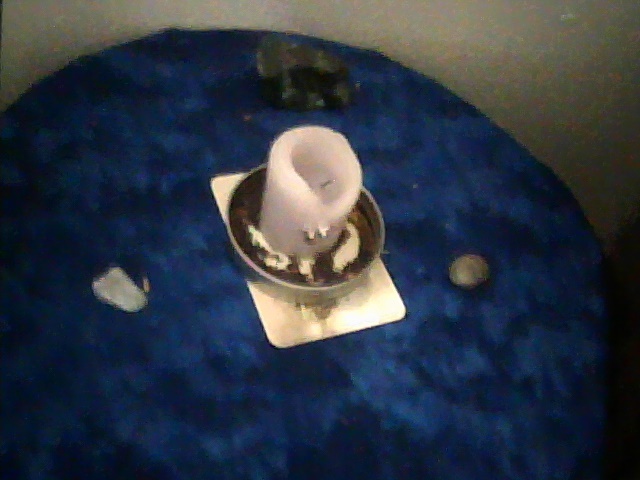 Use this herb on the altar when you've need of any of these energies as it is sometimes easier to grab a dandelion from the front lawn than it is to collect another representative item. The root brewed in a tea brings psychic impressions and dreams. Adding dandelion to an herbal amulet for abundance increases financial acumen and opportunity. Medicinal Uses: acute rheumatoid arthritis, mumps, hepatitis, respiratory, high fever, throat infections, boils, nettle rash, food poisoning, urinary tract, antibiotic, diuretic. Grown near home symbolizes good luck. I have used honeysuckle flower water (1 pint with 1 tsp of witch hazel for preservative) as a facial wash for beauty and to aid in Faery glamour magick. Ring green candles in honeysuckle to attract money, or place them in a vase in the house for the same purpose. 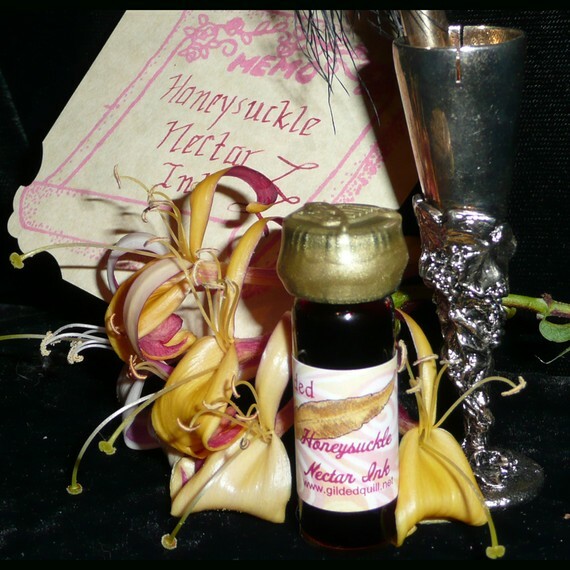 The use of honeysuckle in any herbal formula brings increase and energy. "This colorful bottle of pink ink shimmers with gold swirls. It has been hand mixed with the sweet scent of Honeysuckle, a favorite of Hummingbirds! This ink would be good for use with metal or glass nibbed pens. Honeysuckle is a beautifully sweet and floral scent. In aromatherapy it can help memory and recollection as well as generate emotions of happiness. In color magic, pink is for happiness, fun and romance. Gold is for illumination, wisdom, and wealth." I think this ink would be perfect for good luck magic as well when used to write out your intended goal and carried with you through the day to help achieve it. Medicinal Uses: In Chinese medicine it was used for heart disease, tuberculosis, dry coughs, and gastric problems. It’s used externally for broken noses and hemorrhoids. Used to stop profuse menstruation and is also used as a laxative. Said to be an aphrodisiac. The name of the plant was given when the root was cut transversely and that the characters shown looked to be Hebrew letters. Legend has it that Solomon set his seal on the plant in testimony of its medicinal and magickal powers. Solomon's seal helps to physically manifest the energy and dreams of the practitioner. 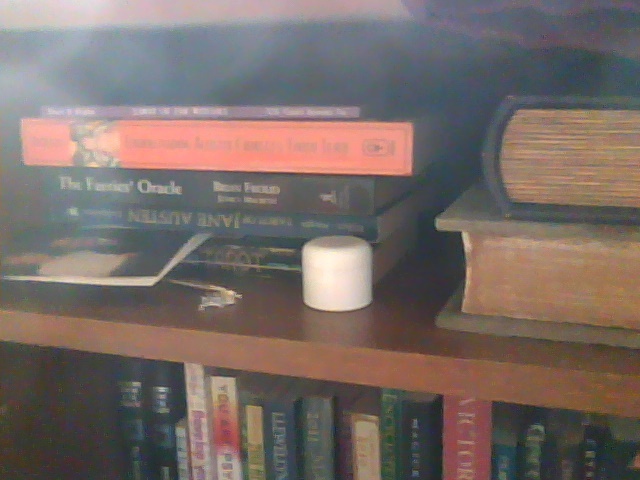 This root is placed in the four corners of the house to guard it...it is also used as an offeratory incense. 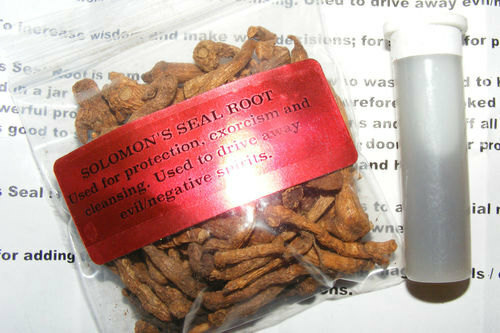 Pictured is Solomon's Seal root sold through Etsy at Occult Supplies. 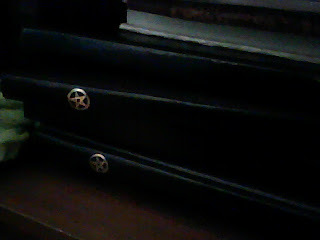 Used for protection, exorcism and cleansing. 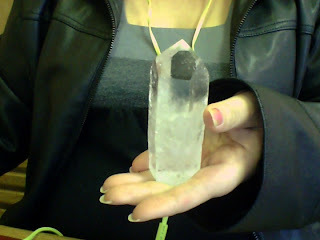 Used to drive away evil/negative spirits. 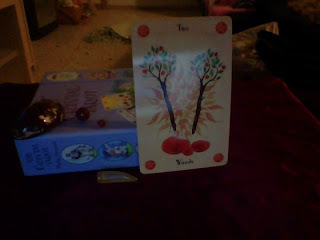 To increase wisdom and make wise decisions; for success; for protection. Solomon's Seal Root is named after King Solomon who was reported to have kept demons confined in a jar by means of a miraculous seal. 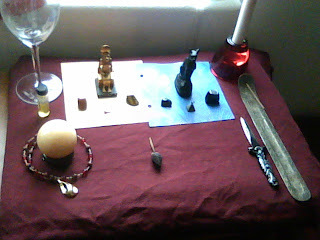 Therefore it is looked upon as being a very powerful protector and is used to banish demons and ward off all known types of evil. It is good to sprinkle the root in front of the outer doors to your property and along window sills to protect family and home. Solomon's Seal is also widely used for bringing success to all financial matters making it an excellent choice for business owners etc.. Perfect for adding to mojo bags / poppet dolls / making magickal oils / cleansing ritual tools, Love potions." Medicinal Uses: enema for round & thread worms in children, topical crèmes for scabies, lice and fleas. Since this plant was given to Ganymede to make him immortal, tansy is carried to lengthen the life-span. Tansy's connection with the Goddess makes it a perfect herb to bless a young girl's first menses and to gift to a woman at her Croning. Blessed Summer Solstice and Super Moon my friends! Melons were especially popular in Renaissance Europe, carefully carved for the deast table. The fruit was originally introduced from the East through Italy. In the Koran, one of the fruits which will be served to deserving Moslems on the day of judgement is melons. 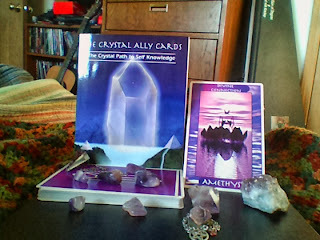 Magical Attributes: Things coming into abundance, full moon magic, joy. 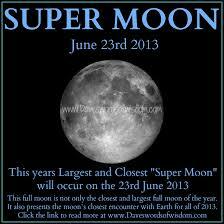 Celebrations: Birthday of the Moon, harvest festival, Feast of the Milky Way...and now, The Summer Solstice Super Moon! Blend the melons, vanilla syrup, and ice until smooth. Pour into cups 2/3 full, then fill with ginger ale. 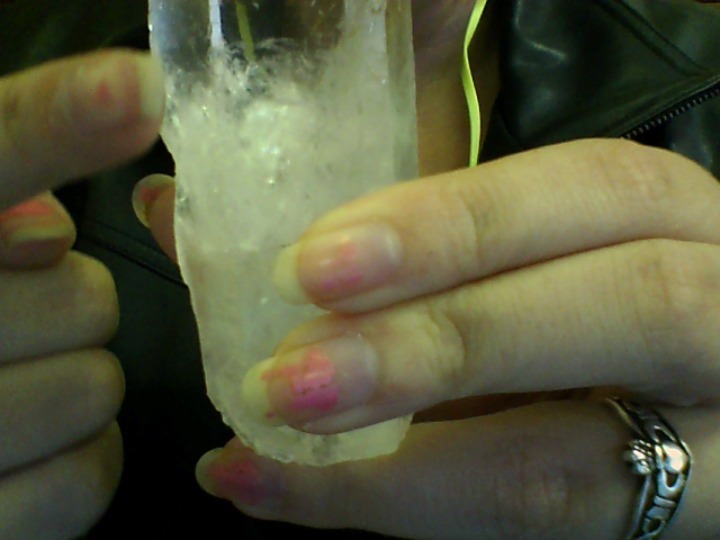 Aysu - my quartz crystal that has a water energy in her. I will be setting her out to be cleansed and empowered. A mason jar of clean water to create a super moon potion for later creations. and a few other selections of stones and crystals for later projects. I hope you all have a blessed Super Moon! I've been super busy for the past while and thought I'd post a fun picture update. This is a gift I was recently given by my dear Aunty Flanna who uses it for divination. 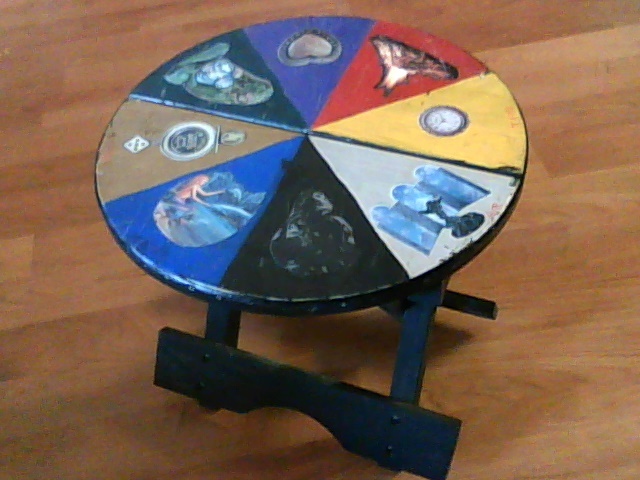 This table has a specific style set up for it using the 4 elements as well as 4 aspects - Death or Change, Time, Chance, and Love. 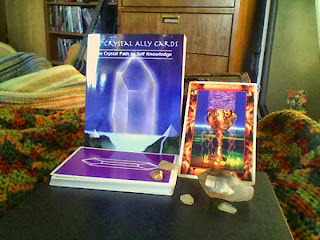 It was part of a Collection of New Divination Tools from her. 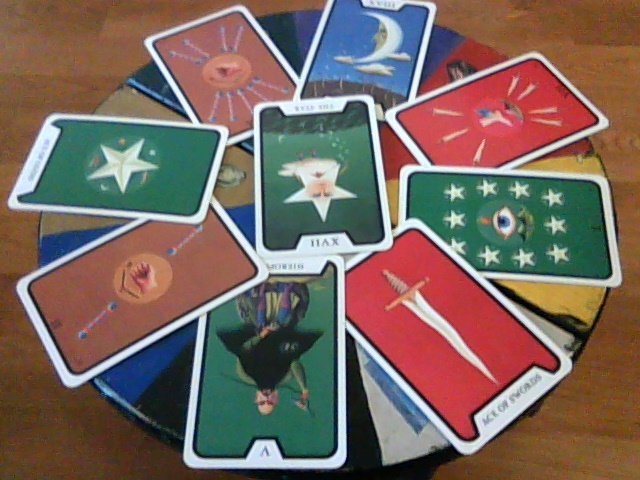 I've been using the table also to do my Wheel of the Year readings as there are 8 sections. It works perfect. My new Sekhmet Matron Deity Altar featuring 2 figurines that I received also from my Aunty Flanna. 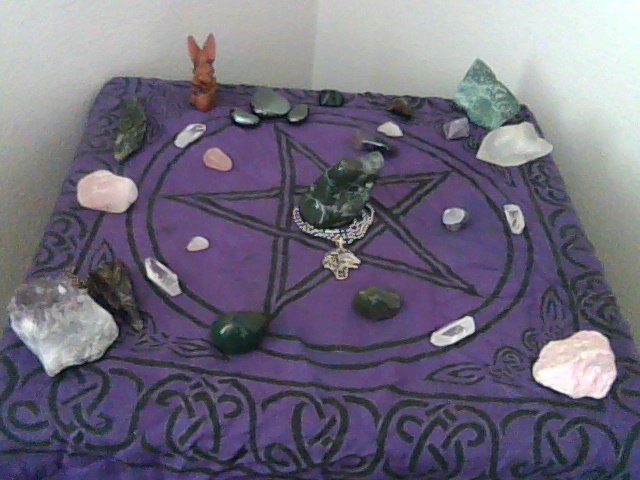 A healing altar for a dear friend of mine. It is still in place and if you would like to send love, light, reiki, prayers too it I would appreciate it. A travel altar for my girlfriend who is currently in the lower 48 to visit her godson and his family. 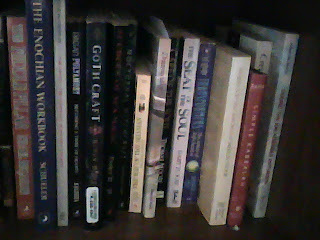 Just a little glimpse at my library in my newest bookcase. 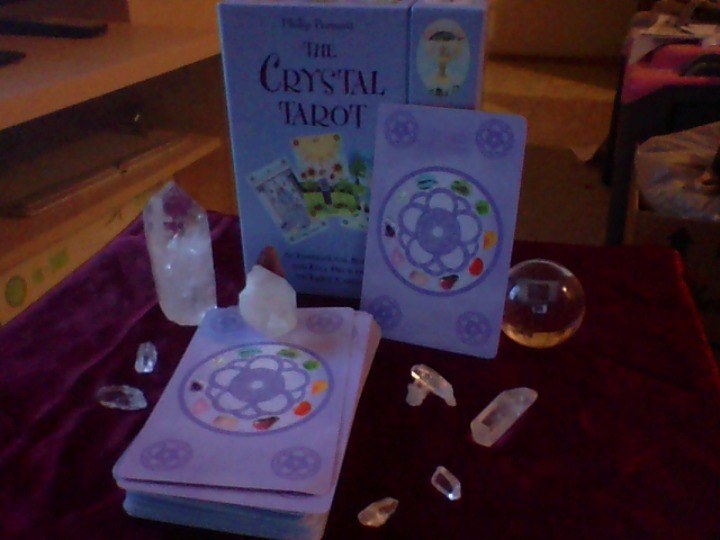 Some books on tarot and oracle decks. 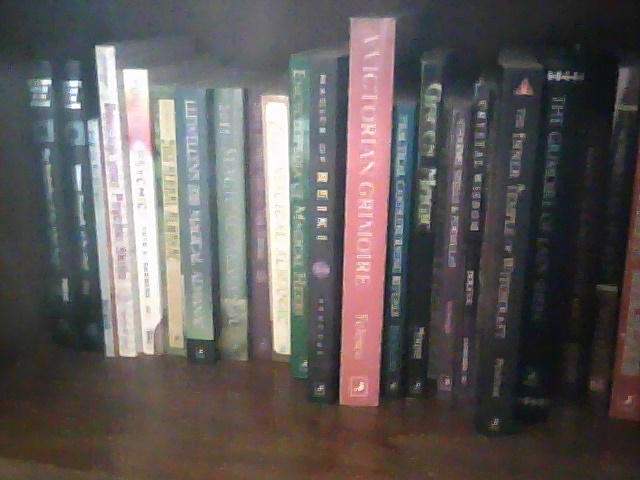 I hope you've enjoyed this little glimpse at my life and what I've been up to.